Set on the backdrop of 1979 a group of troublemaking teenagers led by Mamachari (Hayato Ichihara) decide to prank Chuzai-san (Kuranosuke Sasaki) the local police officer who caught Mamachari's friend Saijo (Takuya Ishida) for speeding on his scooter, Chuzai-san gets them suspended from school which only causes the teenagers to retaliate, They discover that Chuzai-san is married to an attractive woman named Kanako (Kumiko Aso) only making their pranks worse. Aldhafera Nov 02 2018 7:53 pm Naoto Takenaka so damn funny in this movie. Debyan Mar 07 2015 11:20 pm Anybody can tell me what song when Kanako at town cafe? Himawari Jul 27 2013 12:59 am If you like the taste of Japan comedy, you must watch this movie. It has it all that you need to make you laugh all the time you watch this. Beside that, it has great scene and very touchy story about friendship. I've watched it for 3 times and I still like it. This movie is one of the best comedy movies I ever watched. aldy Apr 01 2013 2:48 am I want to know the soundtracks of this film on begin until the end..can you tell to me?? banoenk Oct 14 2012 1:42 am like this much... other film with similar genre? troegan Jun 28 2012 9:17 pm MANTAB !! Setto Mx Jun 19 2012 1:59 am make the sequel please . . .
javier Nov 13 2011 3:22 am anyone please tell me the song when mamachari falling in love ??? rafik Oct 17 2011 6:32 am I love this move very much. If you never watch this movie... you should!!! 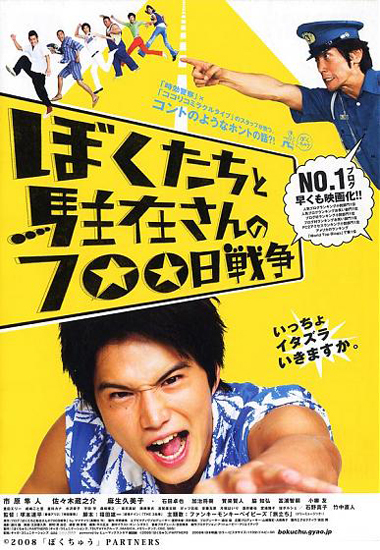 Super_GuNzo Jun 26 2011 8:05 pm very Funny J-Dorama..
muji Nov 21 2010 4:08 am funny ! !